Paved mileage seems to have leveled off between 2008 and 2011. We know about peak car and peak travel. The best recent data strongly suggest that per capita vehicles registered and vehicle-miles traveled topped out sometime in the mid-2000s. These twin transportation peaks may soon add a third to their gang: peak road. Like vehicle miles traveled, paved road mileage steadily increased for decades, from roughly 1.23 million miles in 1960 to 2.6 million in 2011. 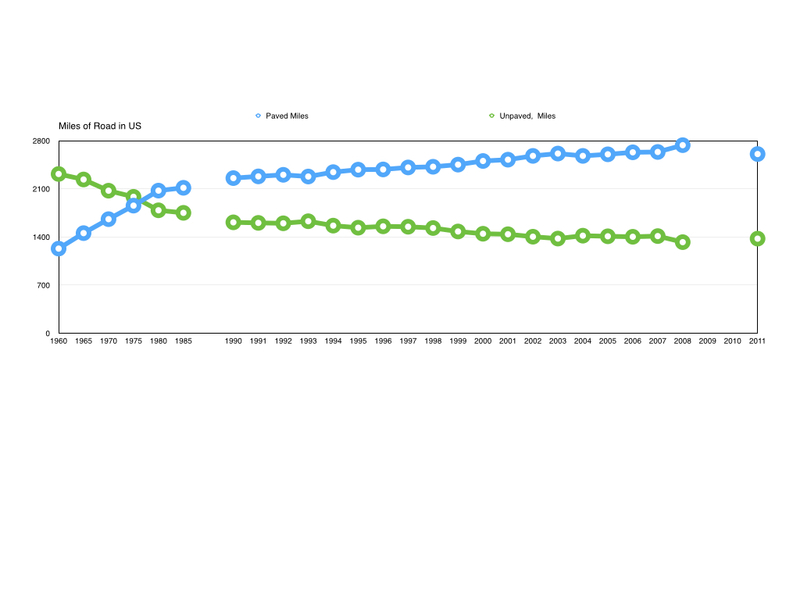 (Unpaved roads followed the opposite trend, declining over time as many became paved.) The paved peak might have occurred in 2008, when mileage reached above 2.7 million. The 2011 mileage, meanwhile, is about the same as that of 2005. Given that the statistical peak coincided with the Great Recession, it's probably too early to call things. It's also important to keep in mind that there are multiple ways to measure a road. There is its end-to-end length (known as "centerline miles") and there is also its total capacity (known as "lane miles") — the latter calculated by multiplying the length by the number of lanes. In that sense, even if centerline mileage has peaked, lane miles will no doubt continue to grow as highways and interstates are widened. This lateral growth may be needed in some under-developed parts of the country to keep up with population. But in many if not most U.S. metro areas the road network is already overbuilt; new lane miles won't add great economic value (since they don't create new access routes) and will only temporarily relieve congestion (since they ultimately encourage new cars onto the road). Levinson thinks the following factors will guide whatever subsequent shifts occur in centerline and lane miles: rural gravelization (converting paved roads into unpaved ones to reduce maintenance costs), tearing down urban freeways, designing complete streets and implementing road diets, and converting general lanes into exclusive bus lanes. Even further ahead, autonomous cars should enable cars to use the existing roadway far more efficiently. Whether we've reached peak road or are merely approaching it, the challenge moving forward is figuring out how to use our existing road space more efficiently. That could mean making lanes reversible rather than building new lanes, or tolling lanes to encourage carpooling and redistribute traffic flows, or running buses on shoulders to maximize capacity, or creating bus toll lanes to prioritize rapid transit vehicles that carry many times more travelers than a car does. As a general rule, it's time to enhance urban roads, not expand them.